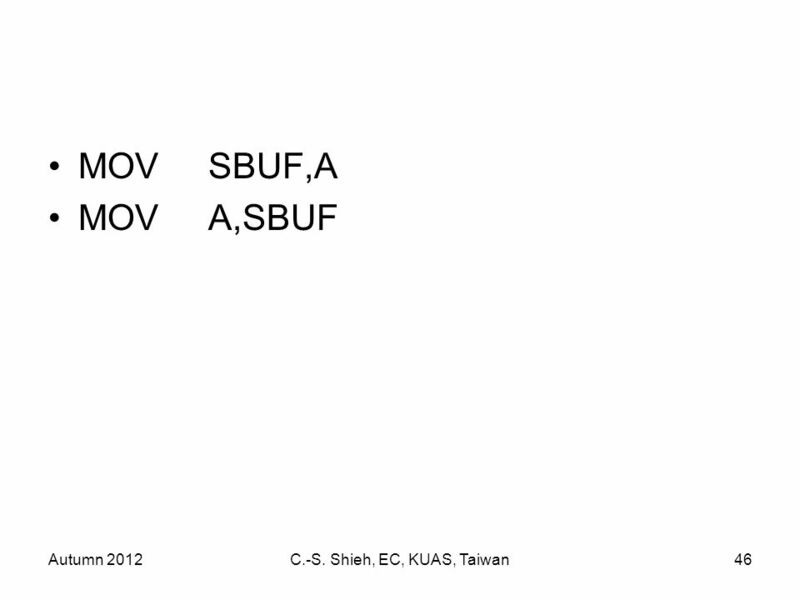 Autumn 2012C.-S. Shieh, EC, KUAS, Taiwan1 The 8051 Family Microcontroller Chin-Shiuh Shieh Department of Electronic Engineering. 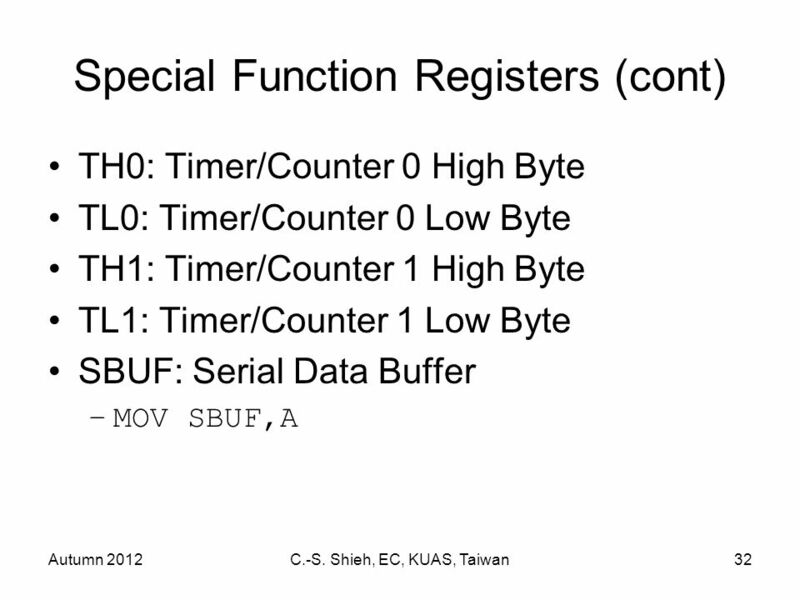 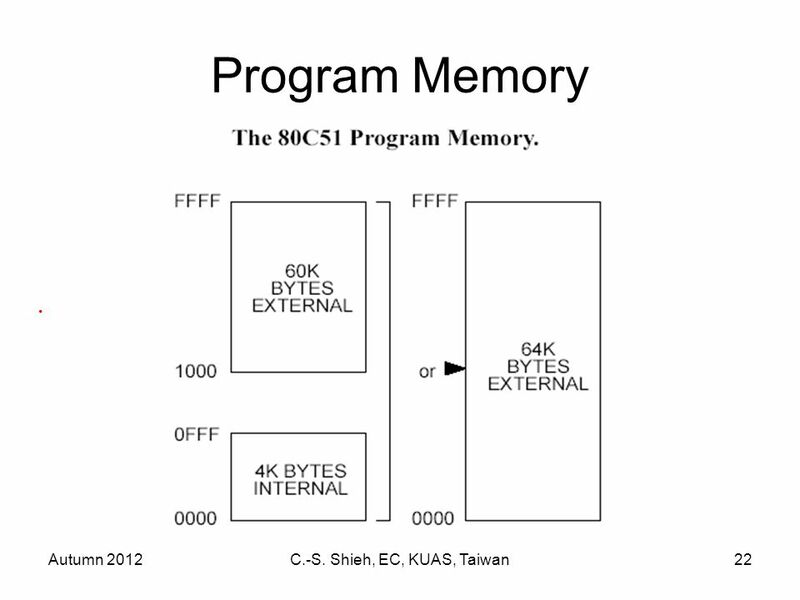 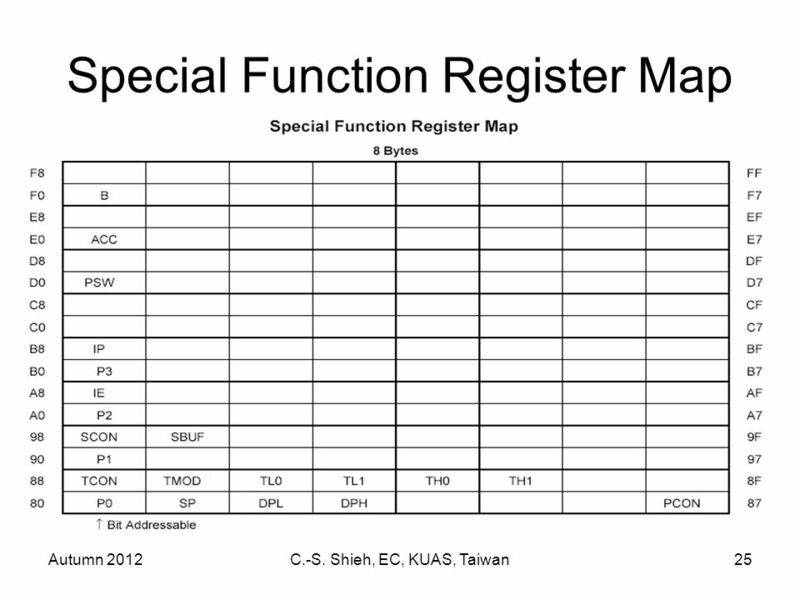 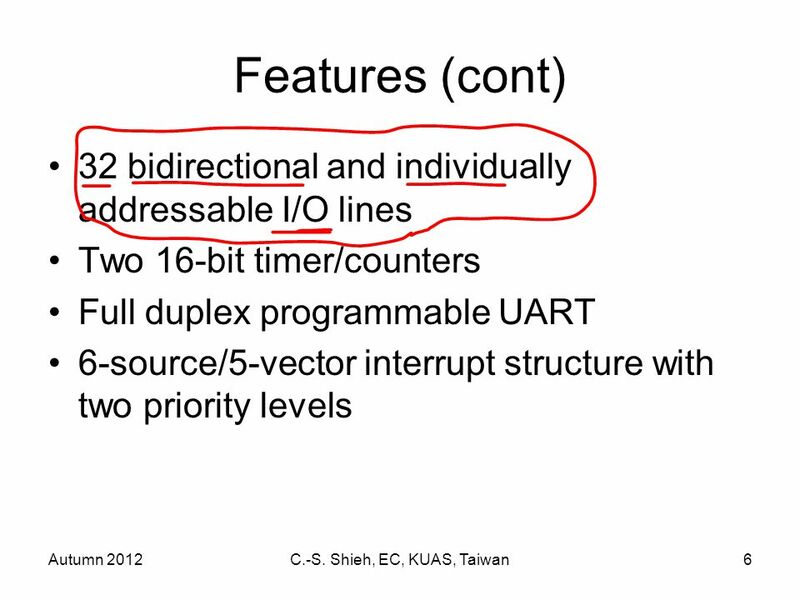 2 Autumn 2012C.-S. Shieh, EC, KUAS, Taiwan2 Microcontrollers Microprocessors, such as 8086 family, have only CCU and ALU in them. 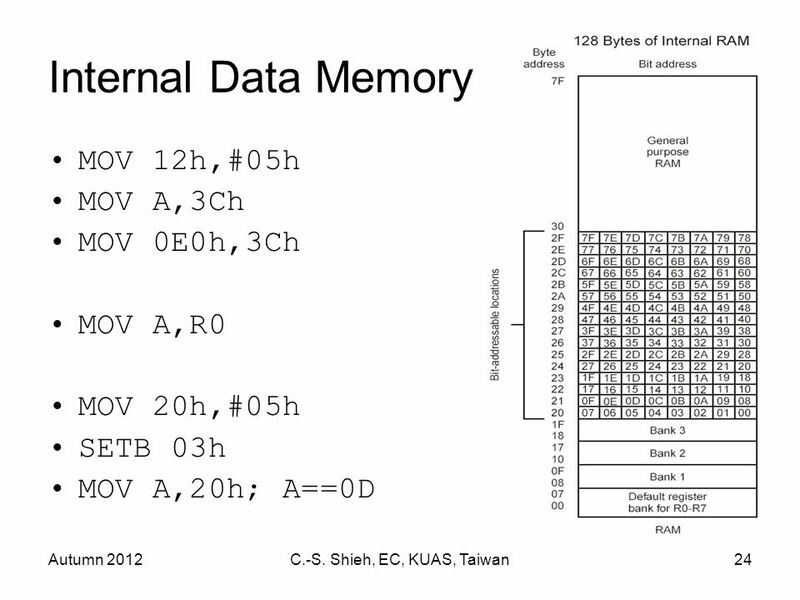 External RAM, ROM, and I/O are required. 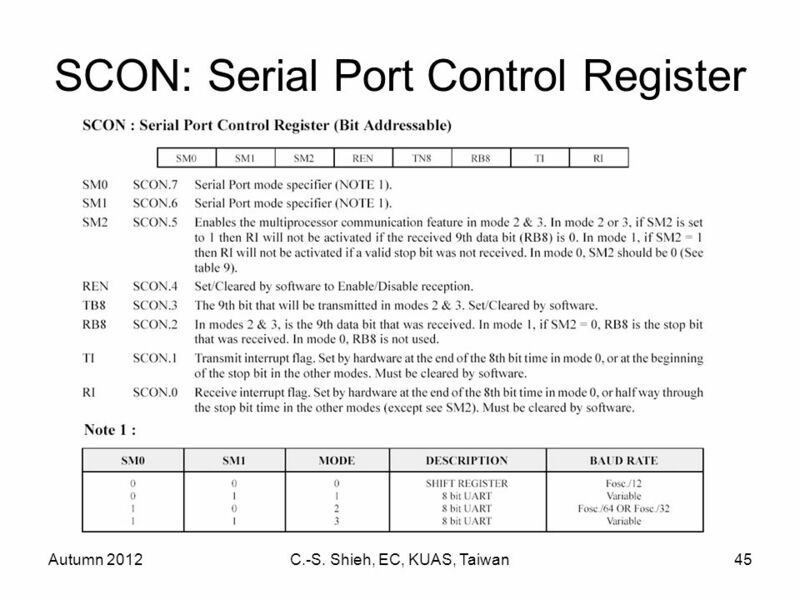 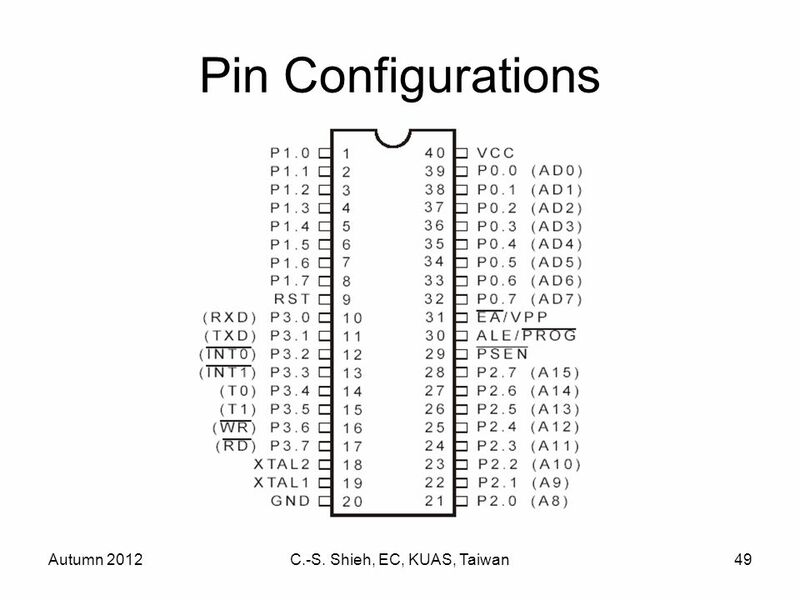 Microcontrollers, such as 8051 family, encompass CCU, ALU, RAM, ROM, and I/O in a single chip, also called single-chip. 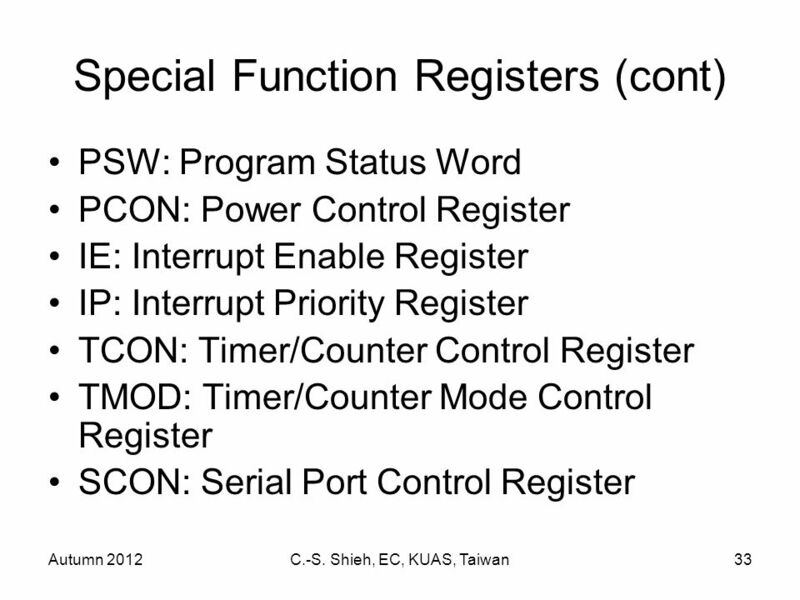 Microcontrollers have limited computational power, but their low-cost make them prevalent in consumer products and small-scale control systems. 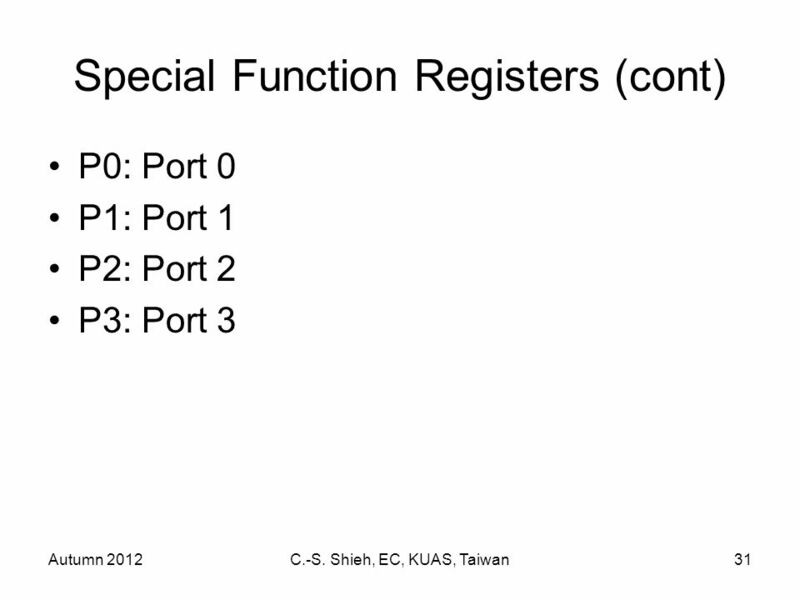 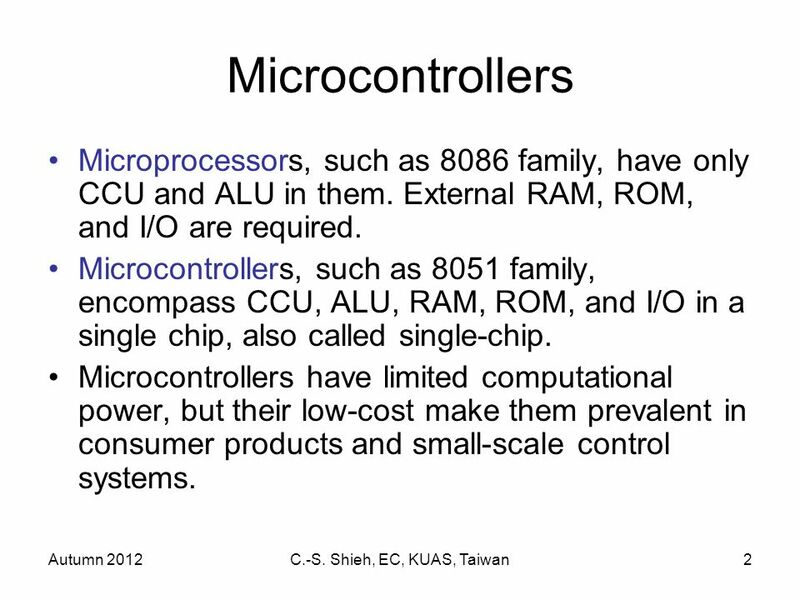 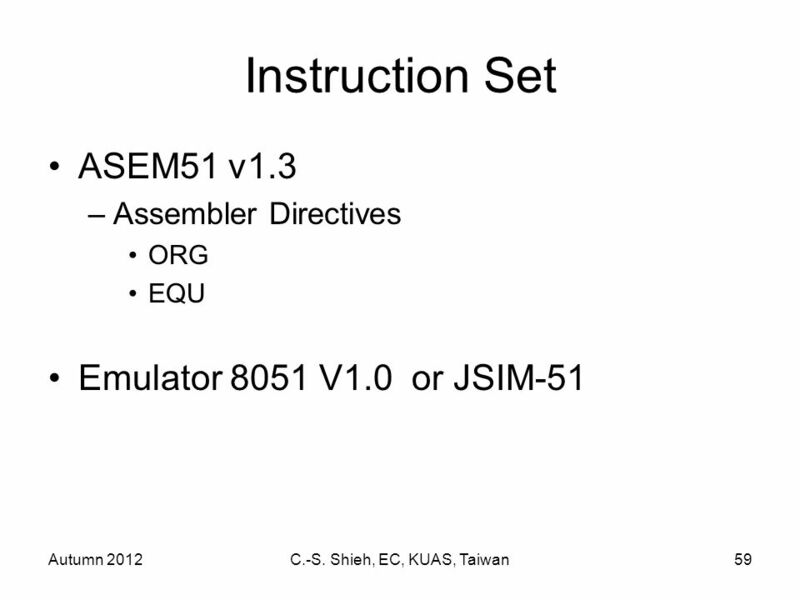 3 Autumn 2012C.-S. Shieh, EC, KUAS, Taiwan3 Microcontrollers (cont) We adopt 8051 family microcontroller in our class for its general structure and manageable system complexity. 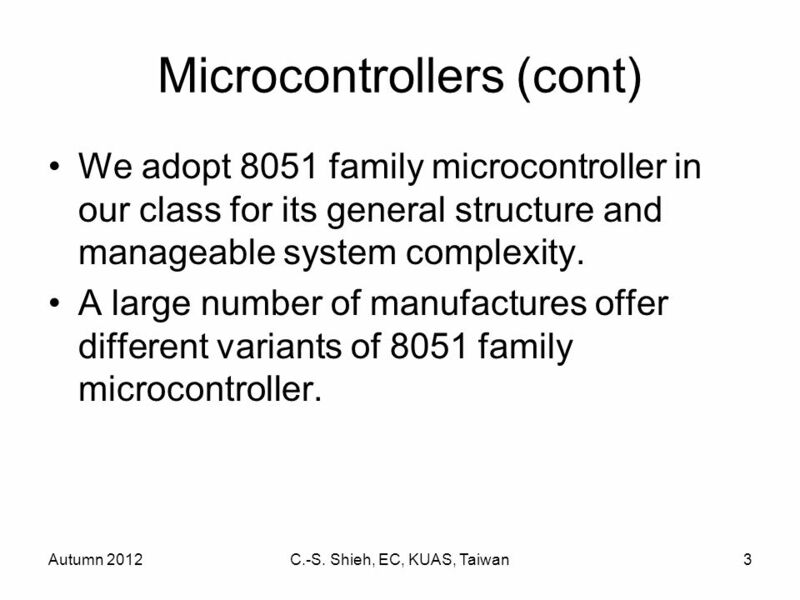 A large number of manufactures offer different variants of 8051 family microcontroller. 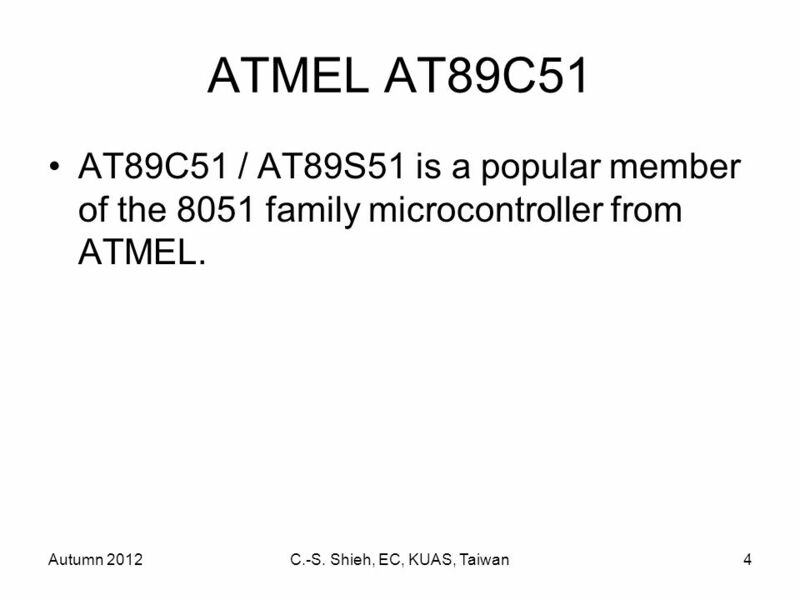 4 Autumn 2012C.-S. Shieh, EC, KUAS, Taiwan4 ATMEL AT89C51 AT89C51 / AT89S51 is a popular member of the 8051 family microcontroller from ATMEL. 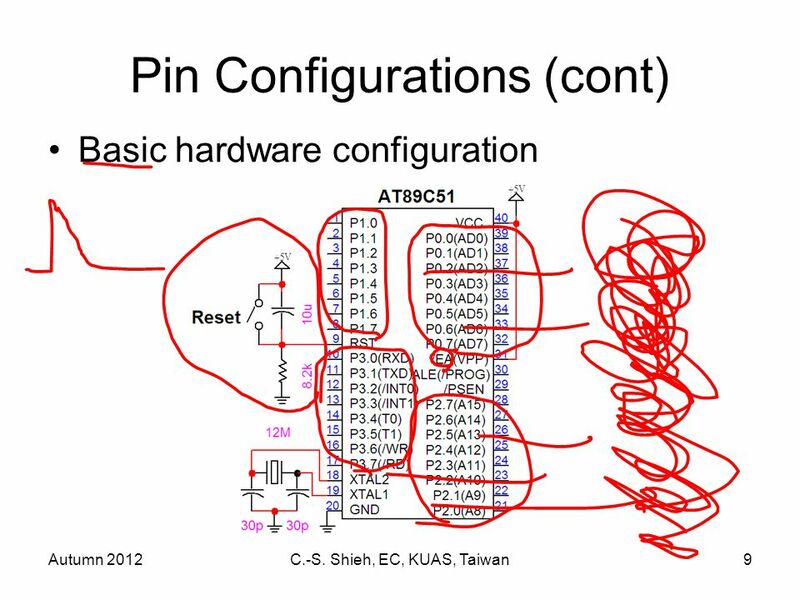 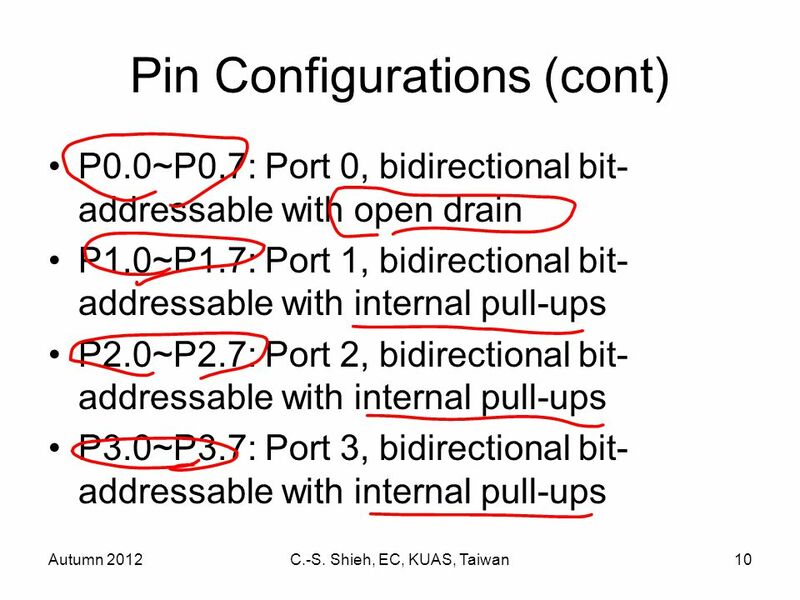 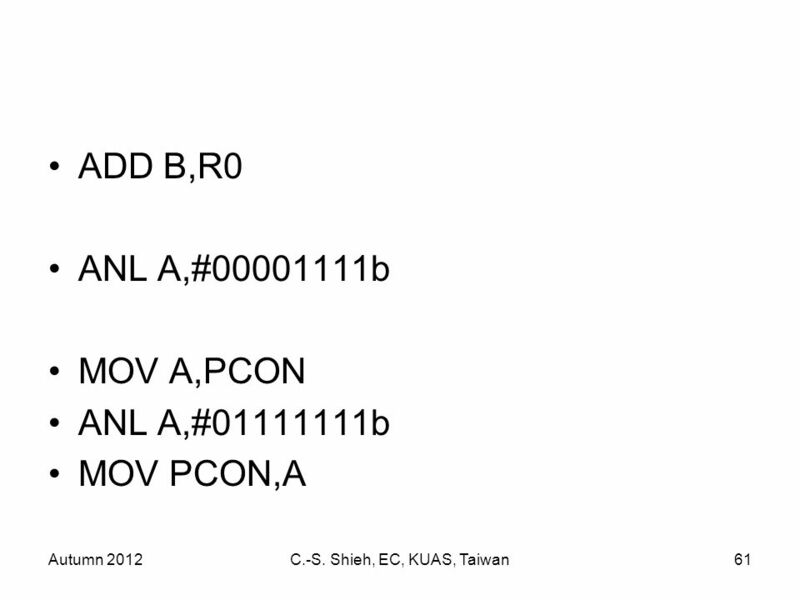 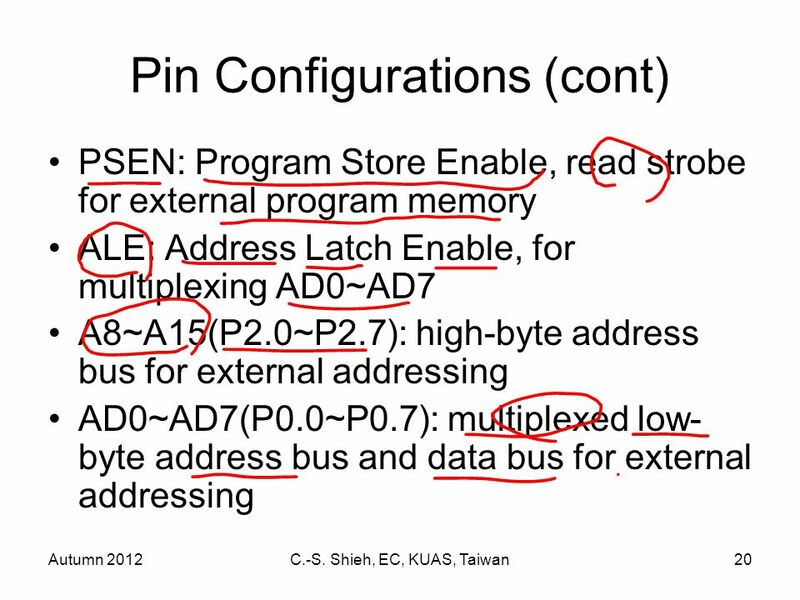 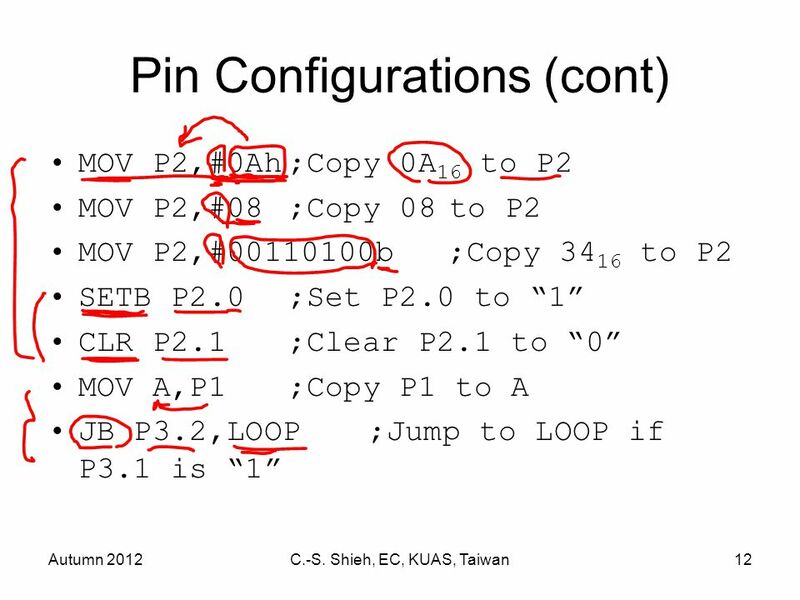 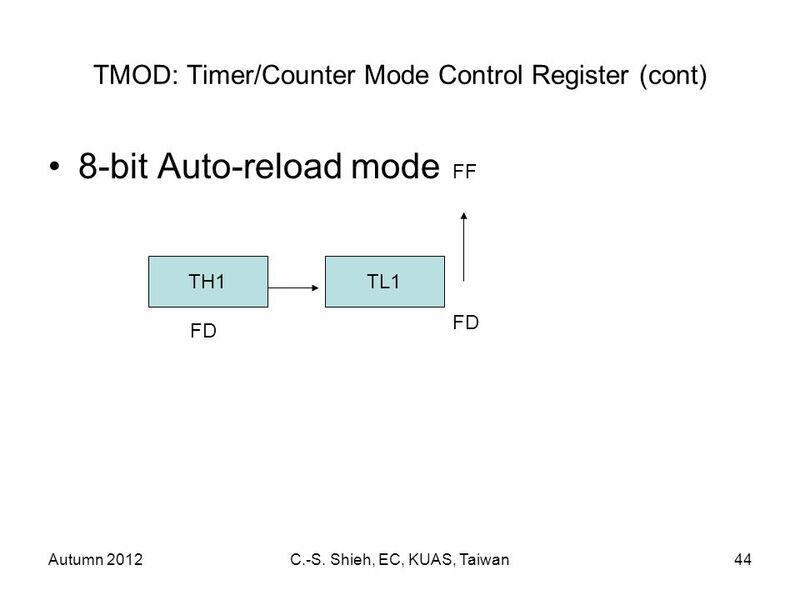 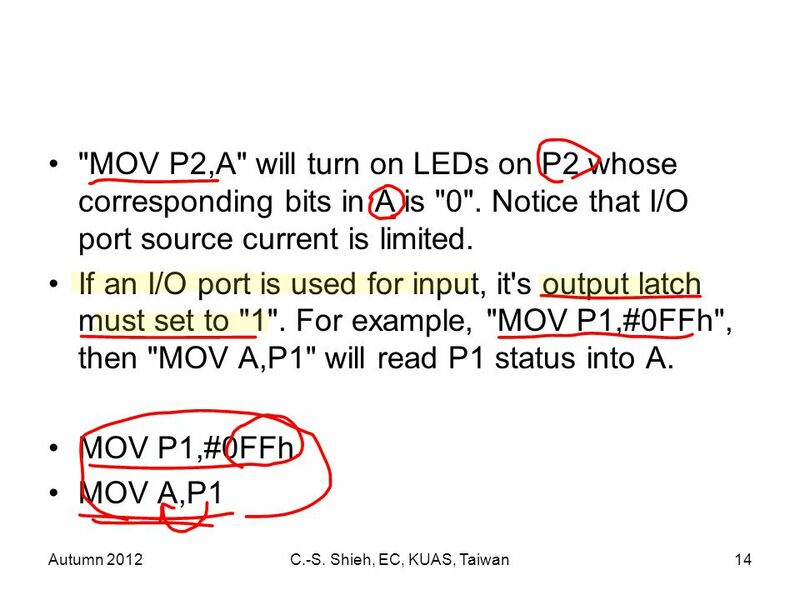 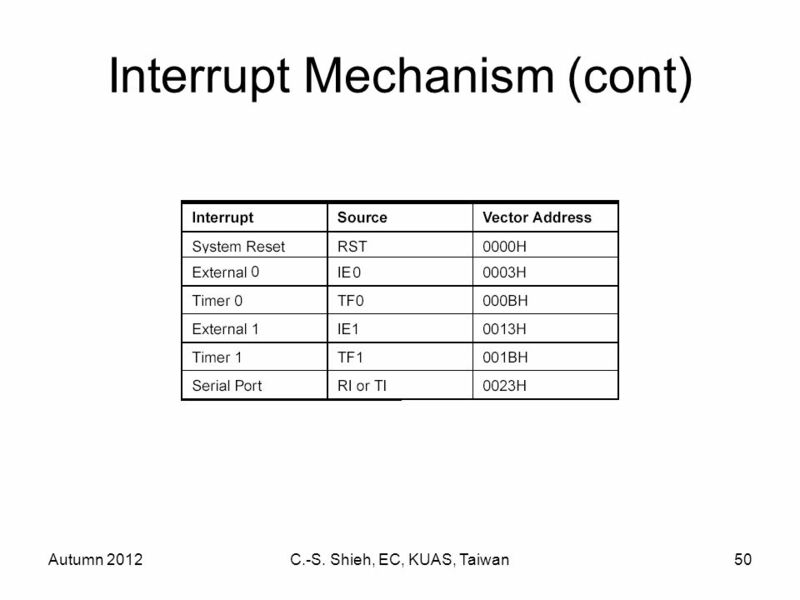 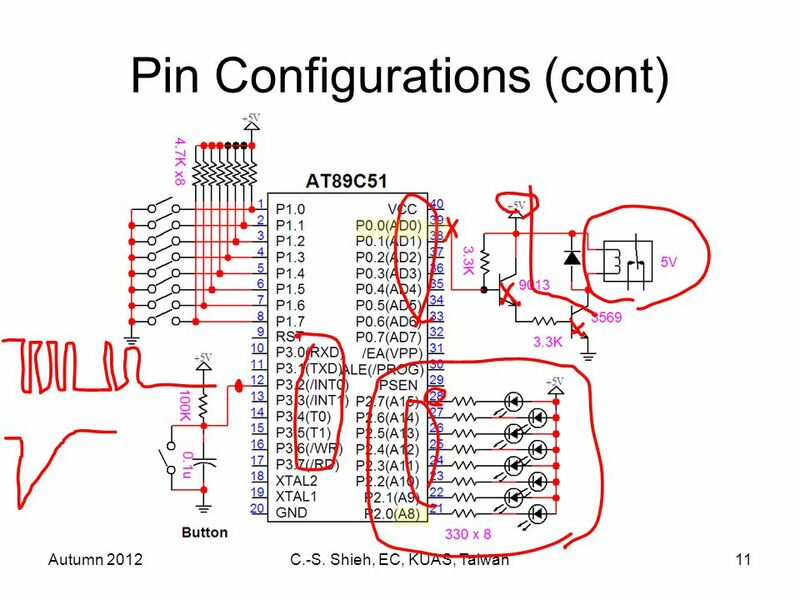 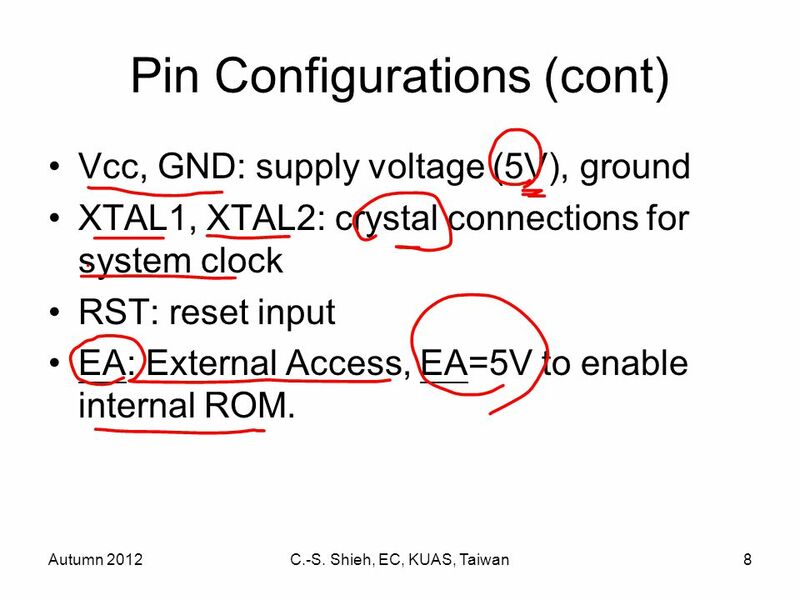 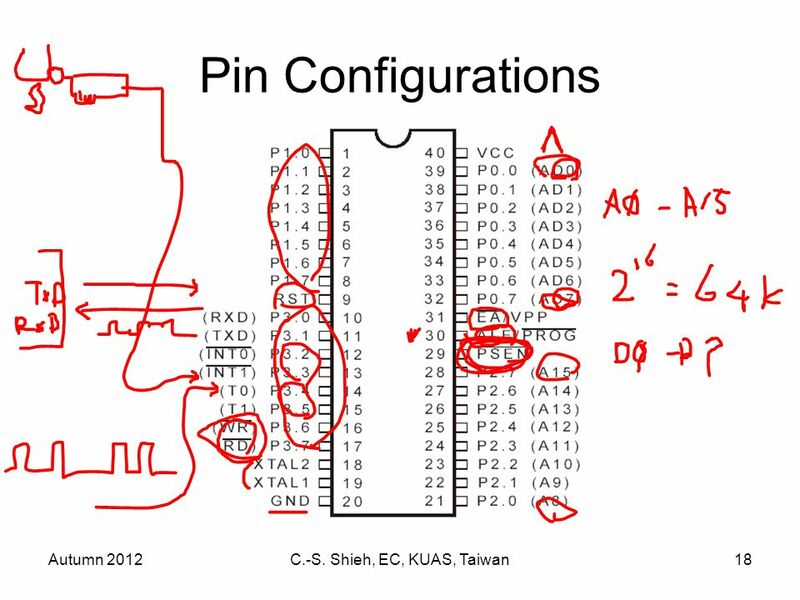 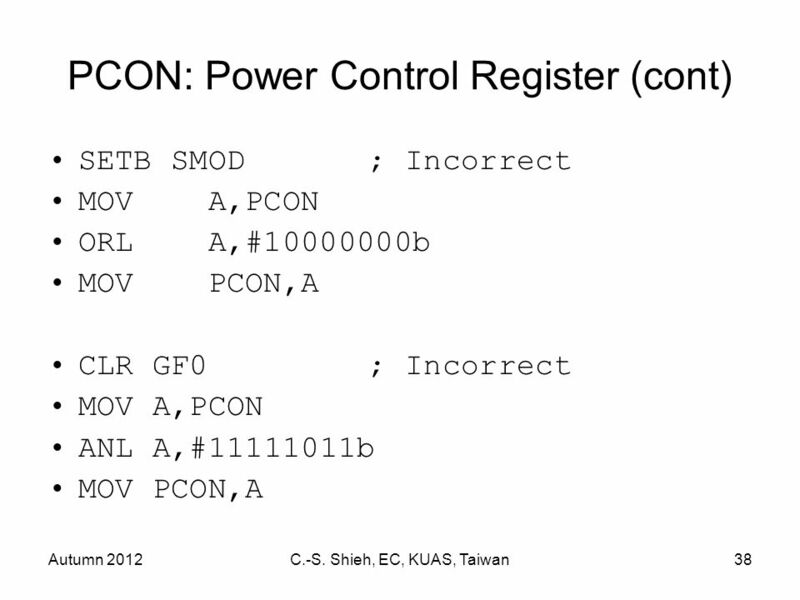 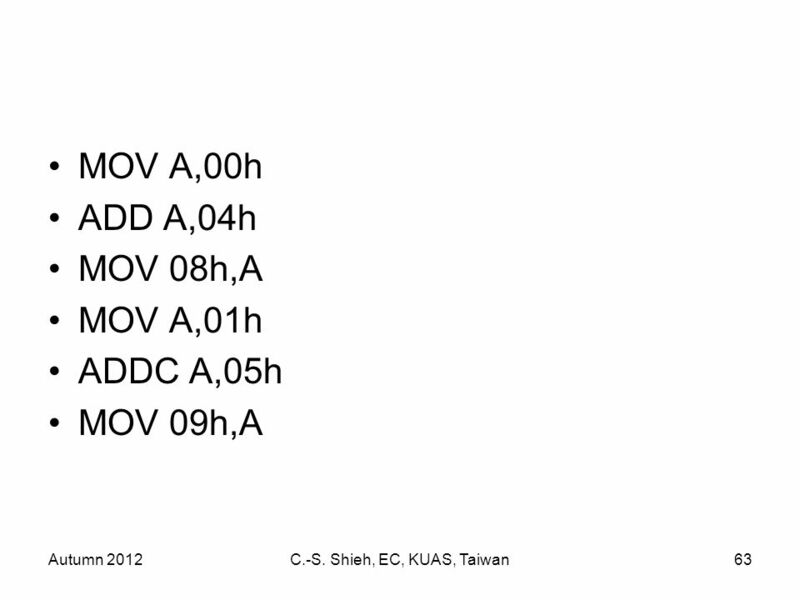 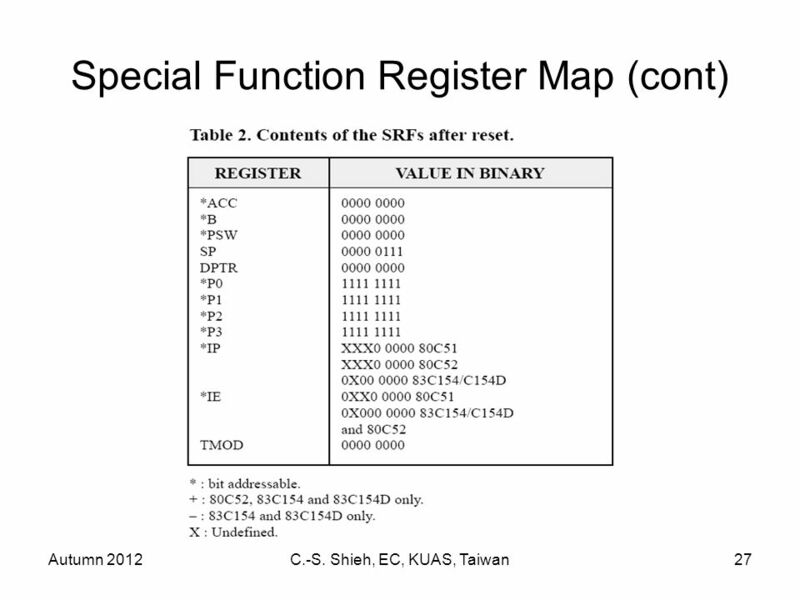 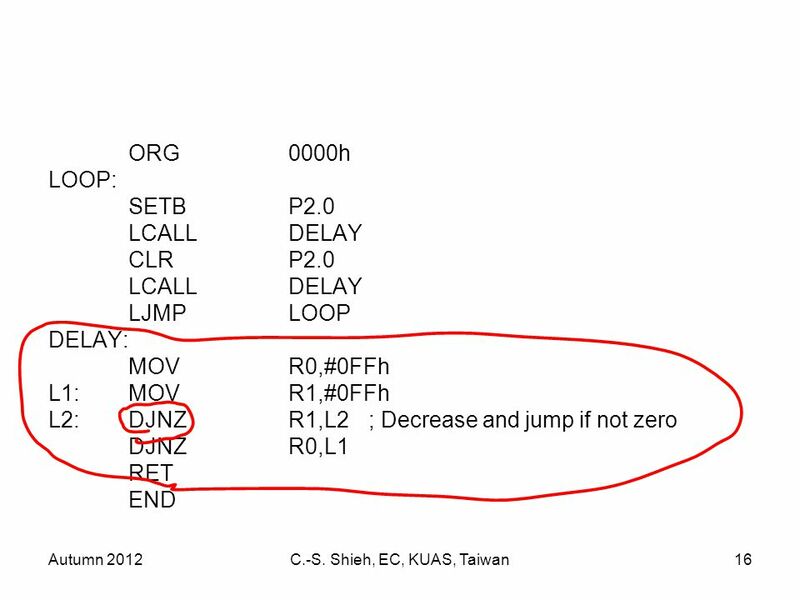 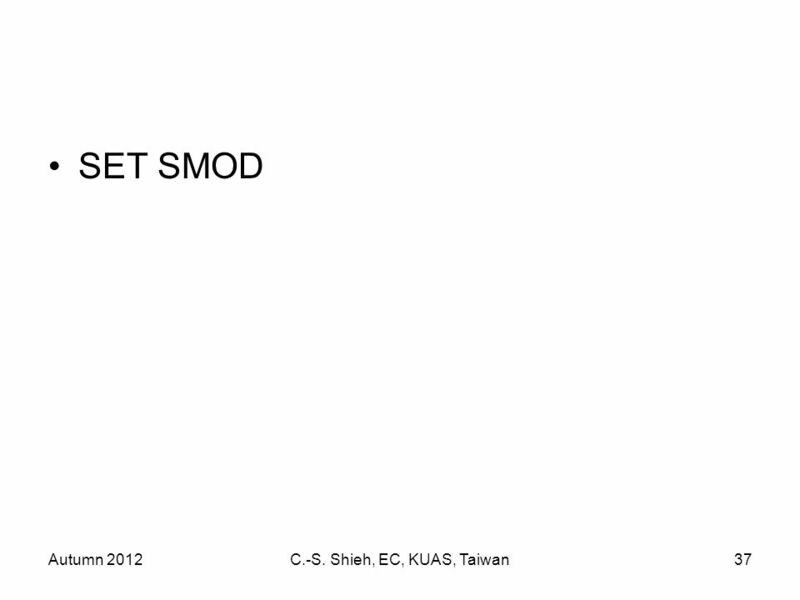 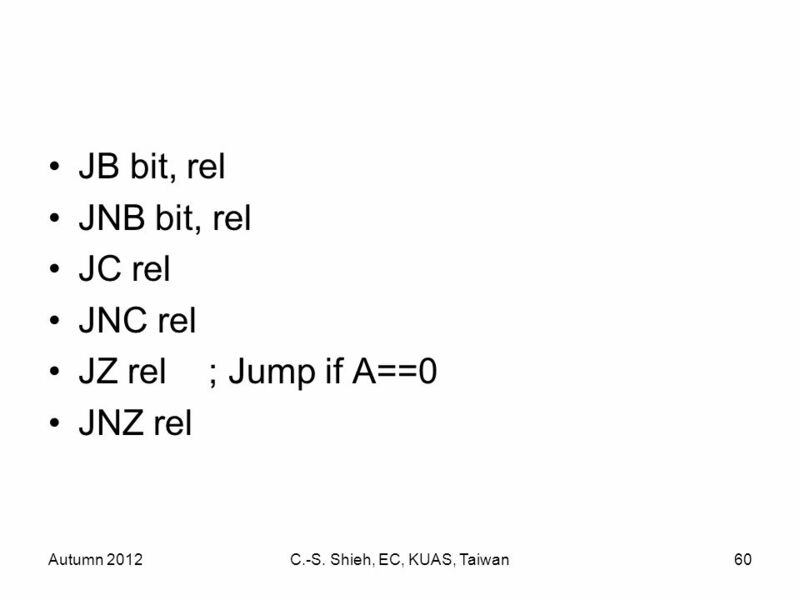 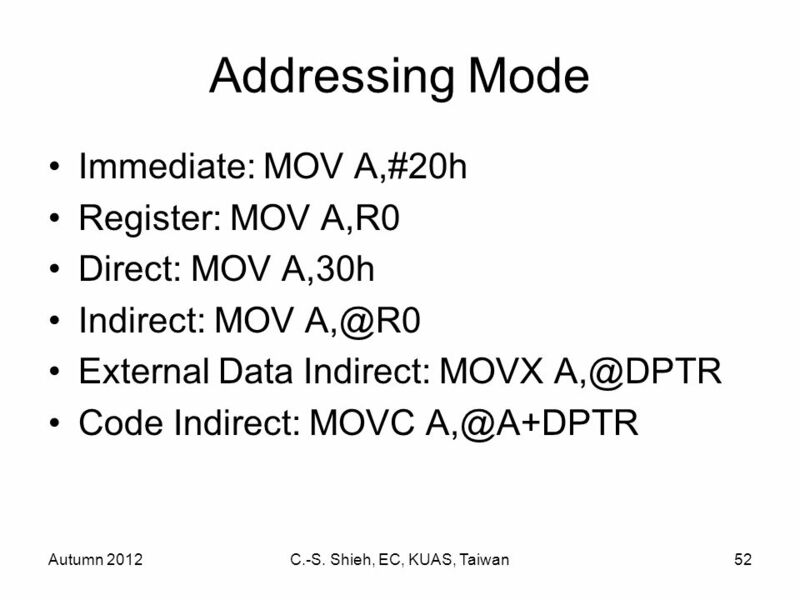 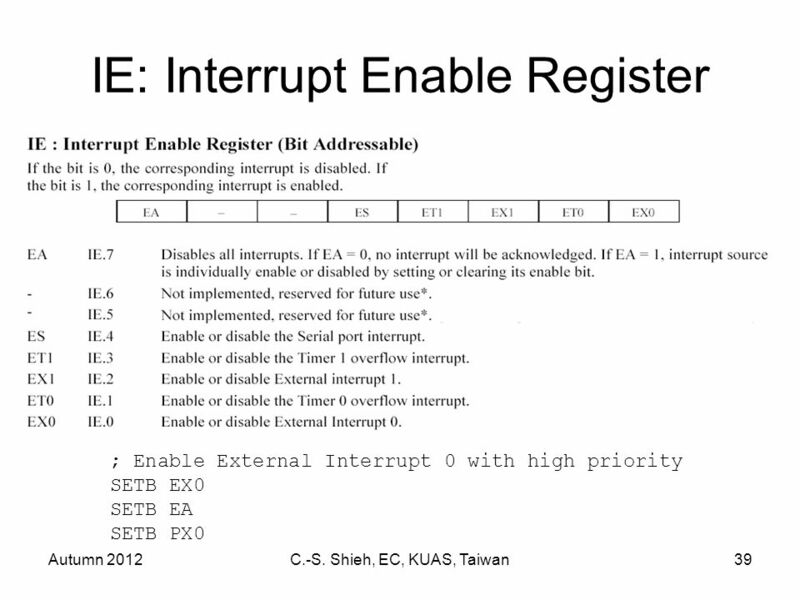 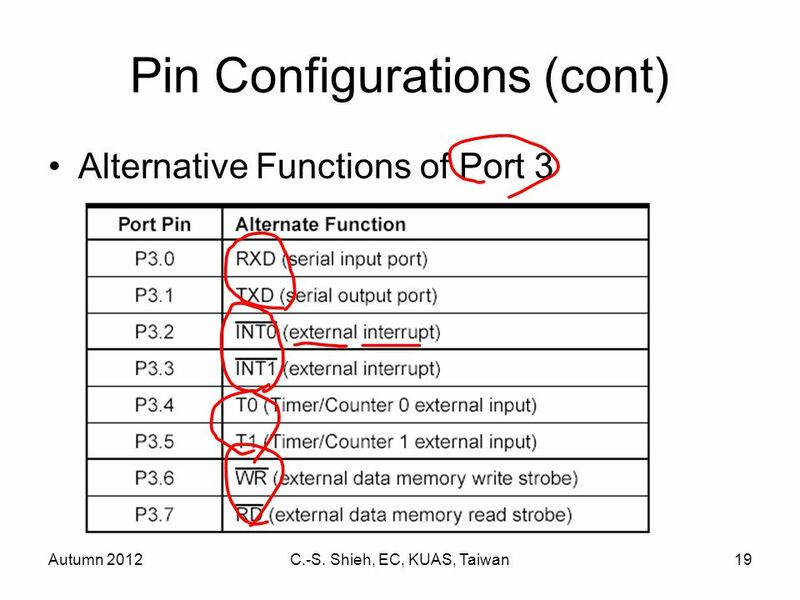 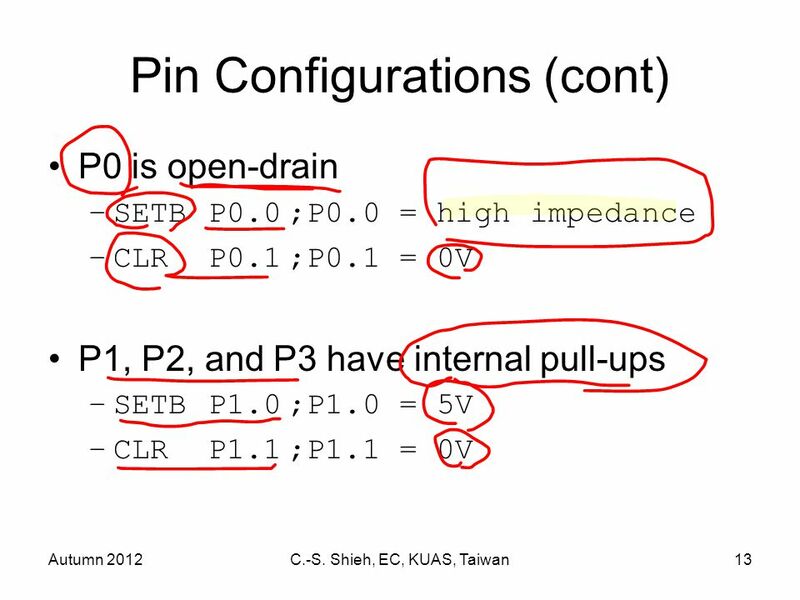 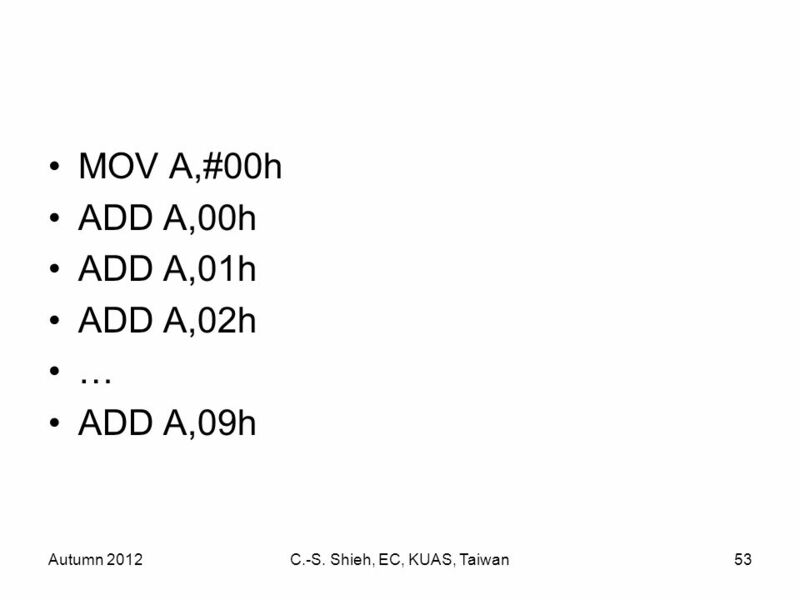 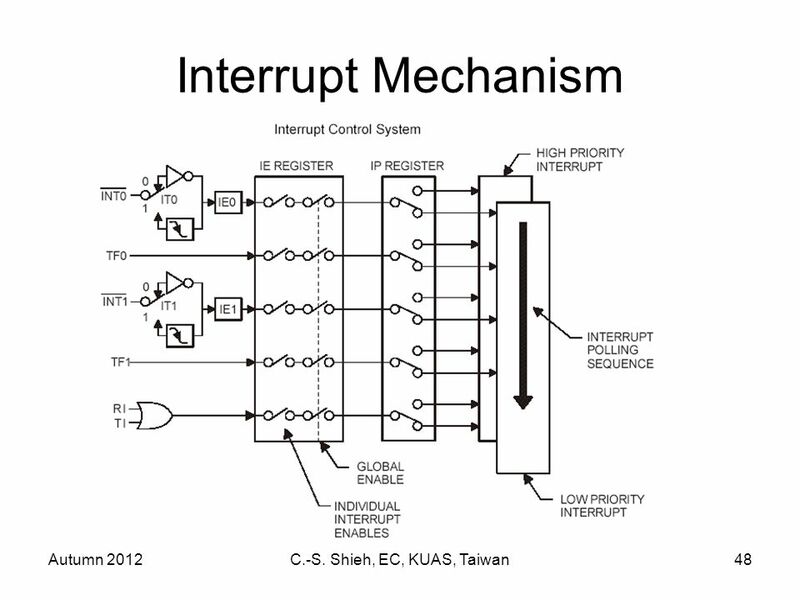 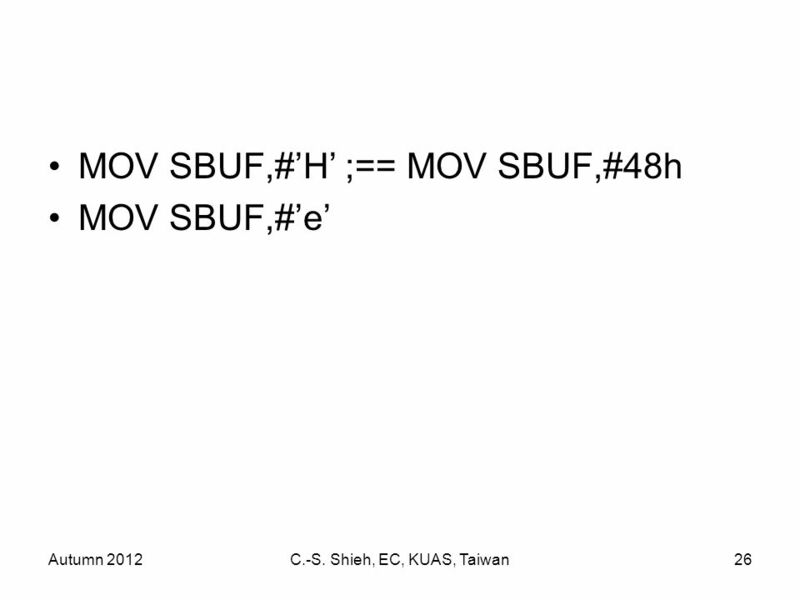 8 Autumn 2012C.-S. Shieh, EC, KUAS, Taiwan8 Pin Configurations (cont) Vcc, GND: supply voltage (5V), ground XTAL1, XTAL2: crystal connections for system clock RST: reset input EA: External Access, EA=5V to enable internal ROM. 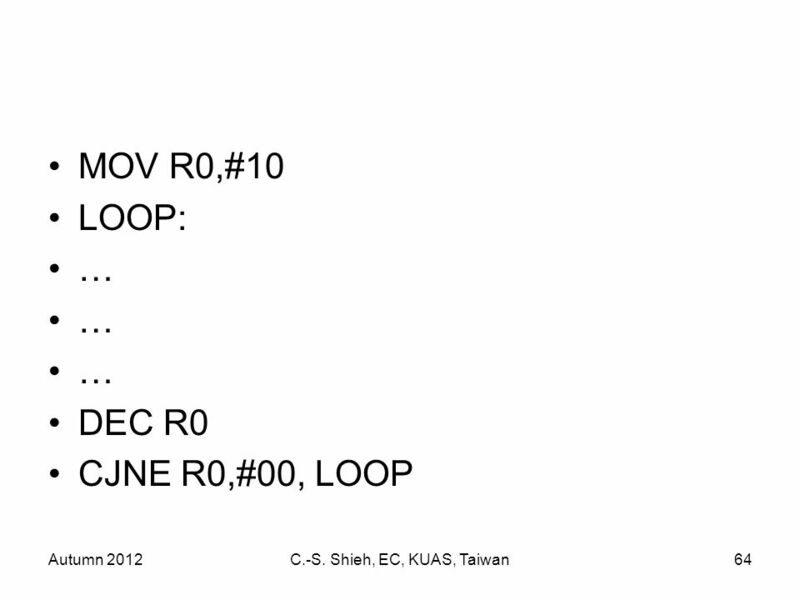 15 Autumn 2012C.-S. Shieh, EC, KUAS, Taiwan15 P0 is open-drain. 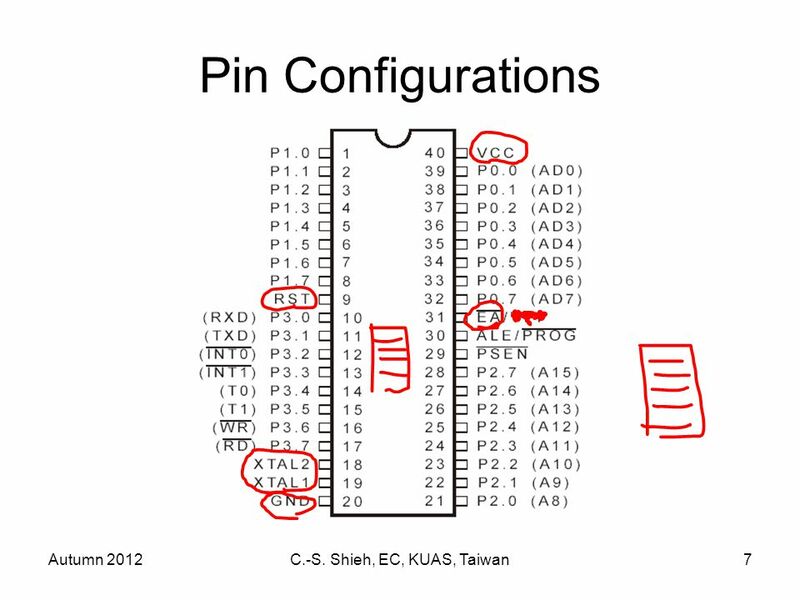 Pull-up resistor is required. 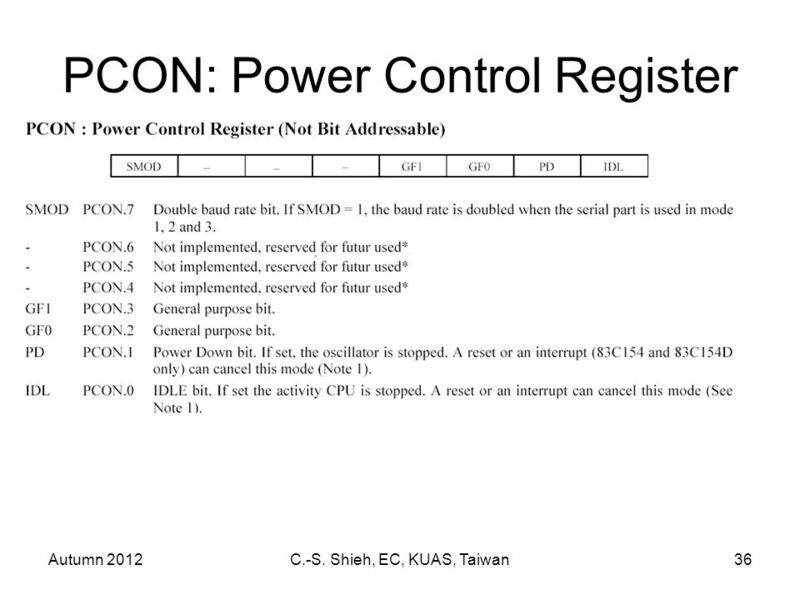 "SETB P0.0" will turn on the relay and "CLR P0.0" will turn it off. 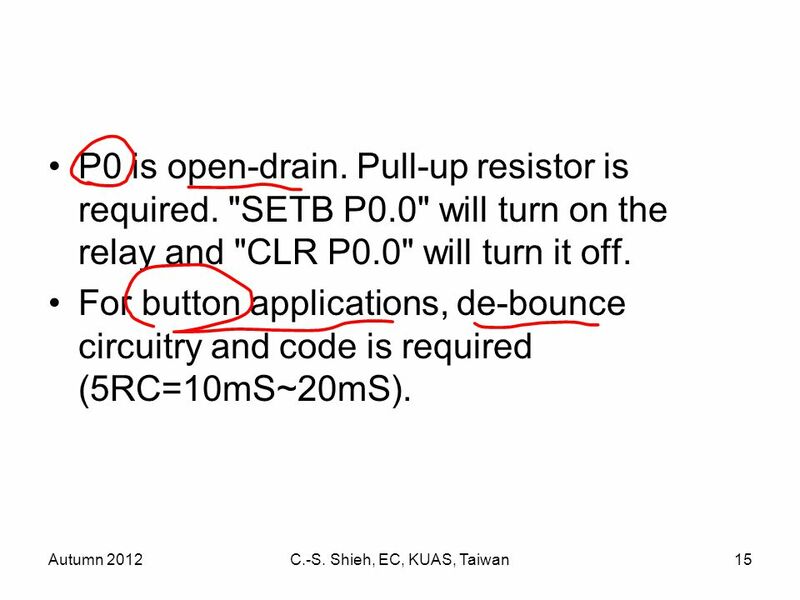 For button applications, de-bounce circuitry and code is required (5RC=10mS~20mS). 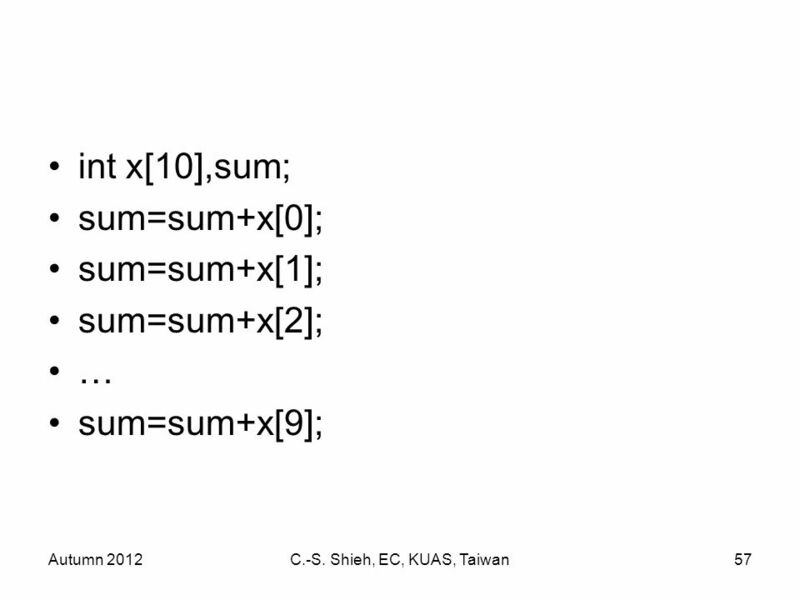 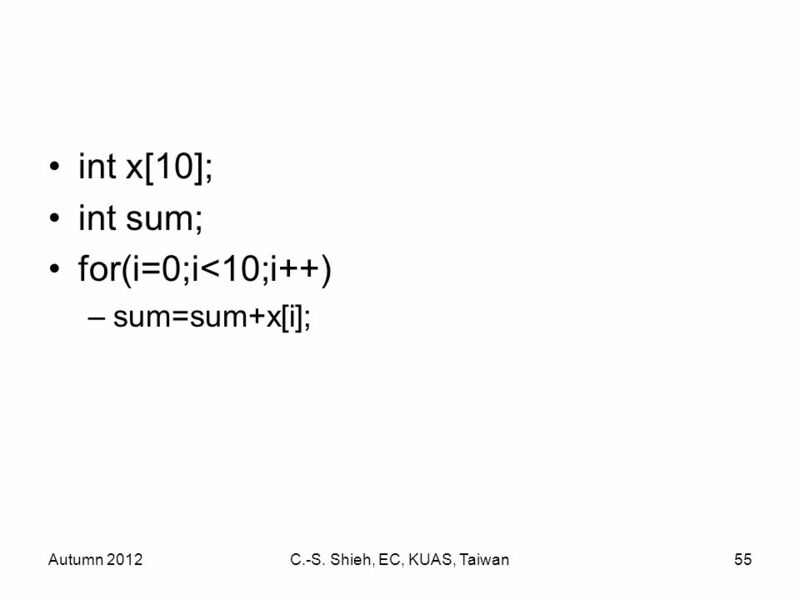 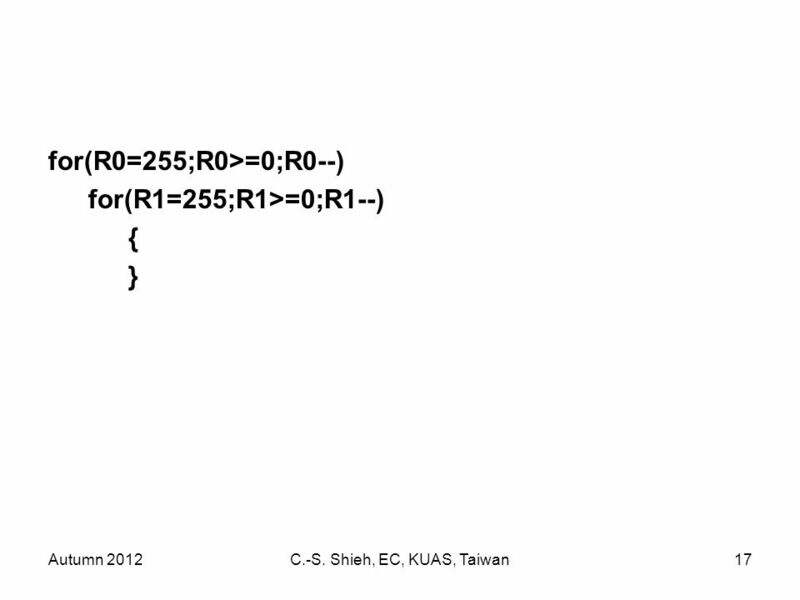 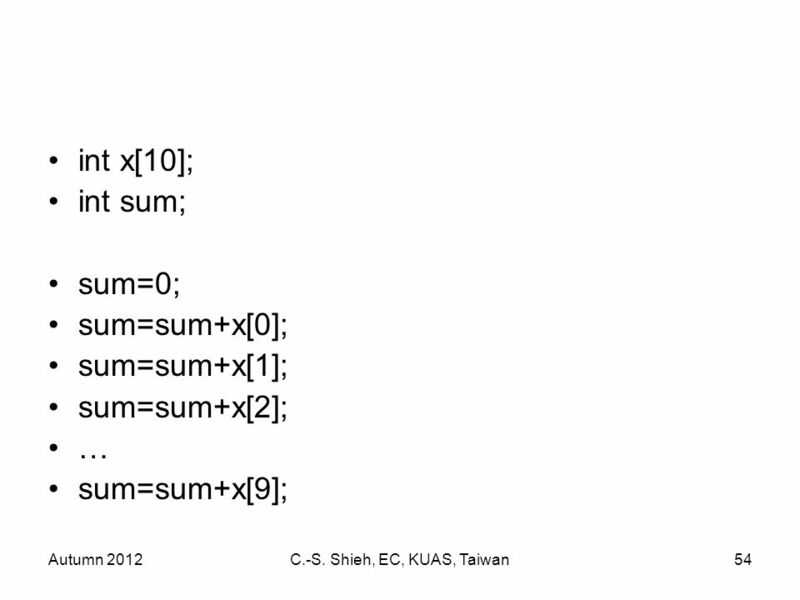 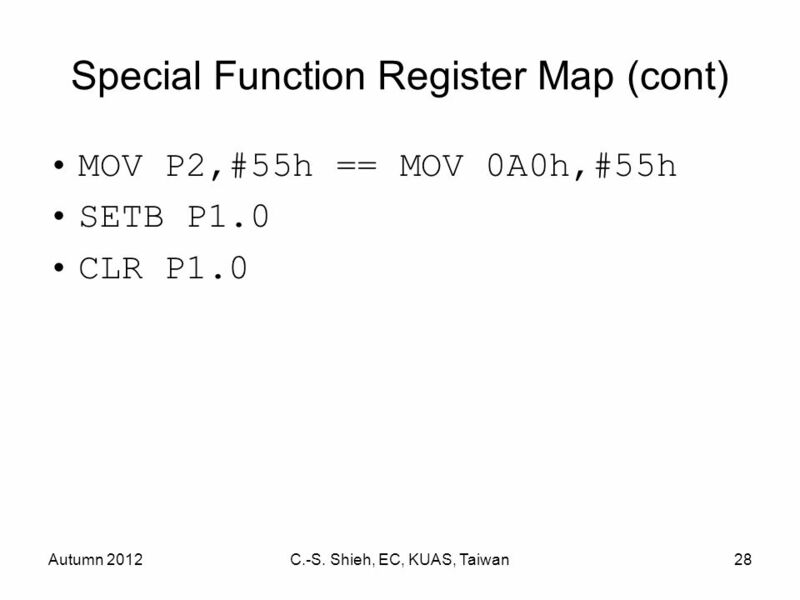 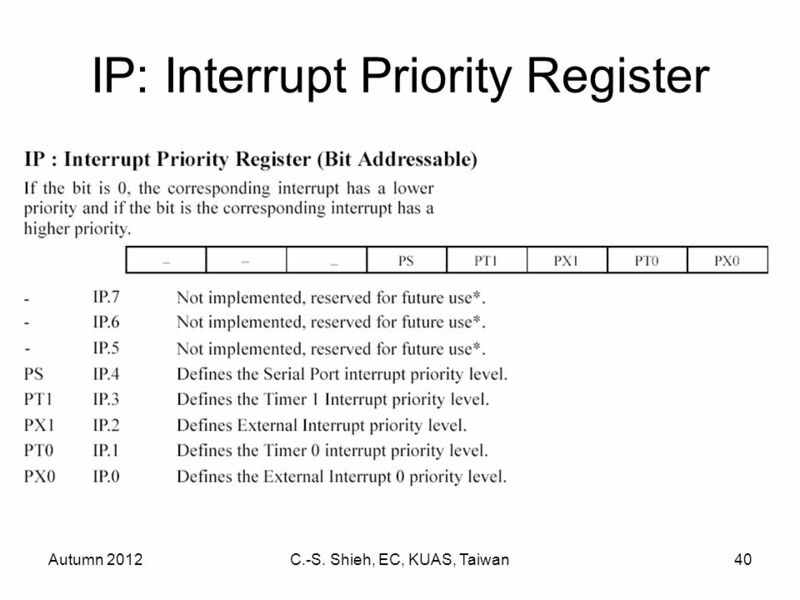 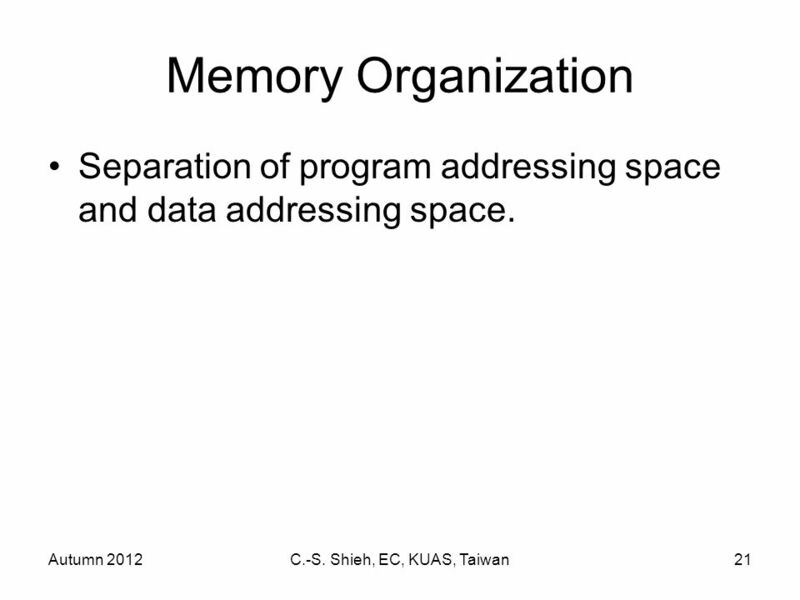 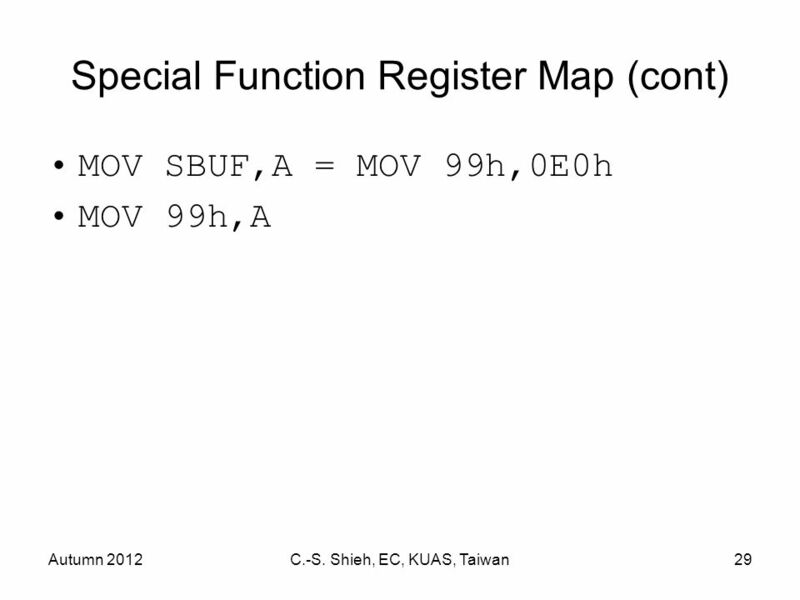 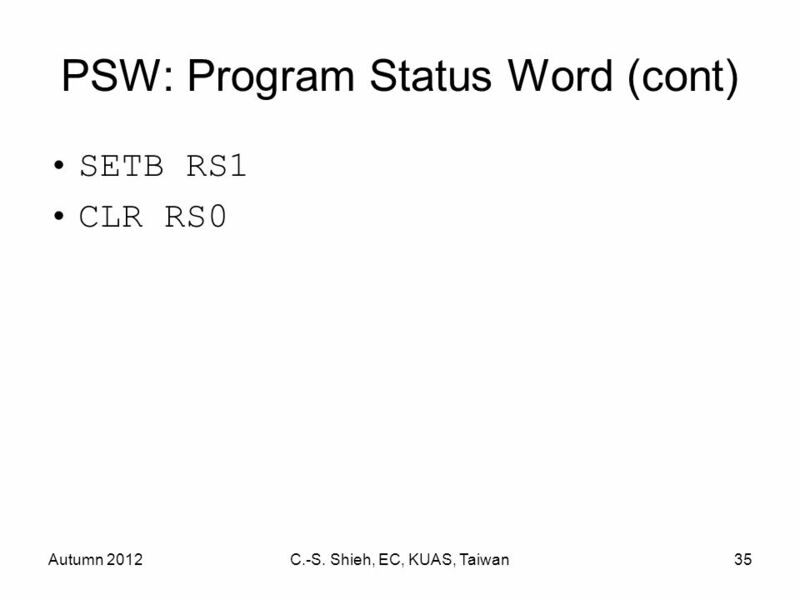 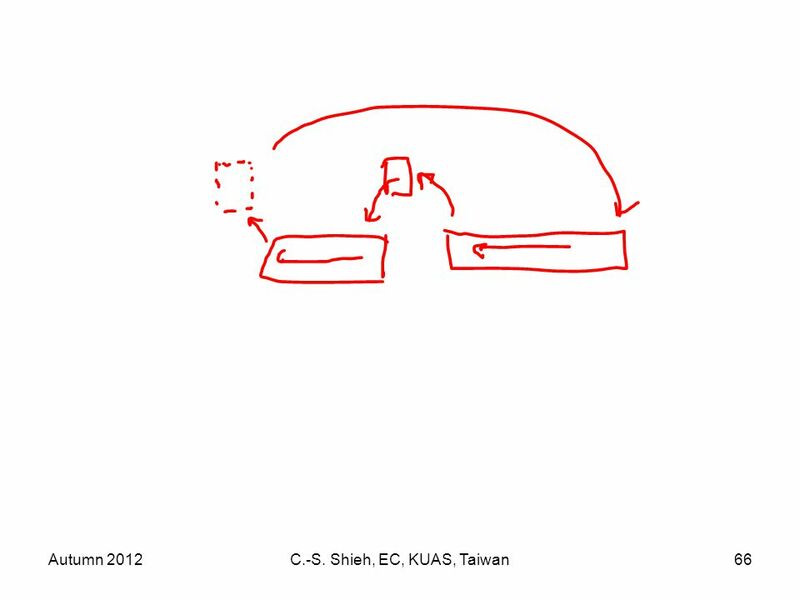 21 Autumn 2012C.-S. Shieh, EC, KUAS, Taiwan21 Memory Organization Separation of program addressing space and data addressing space. 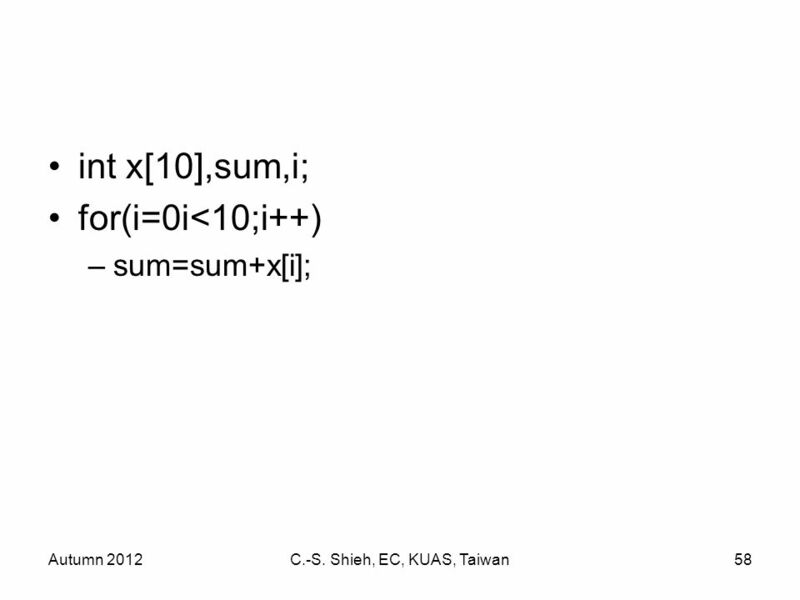 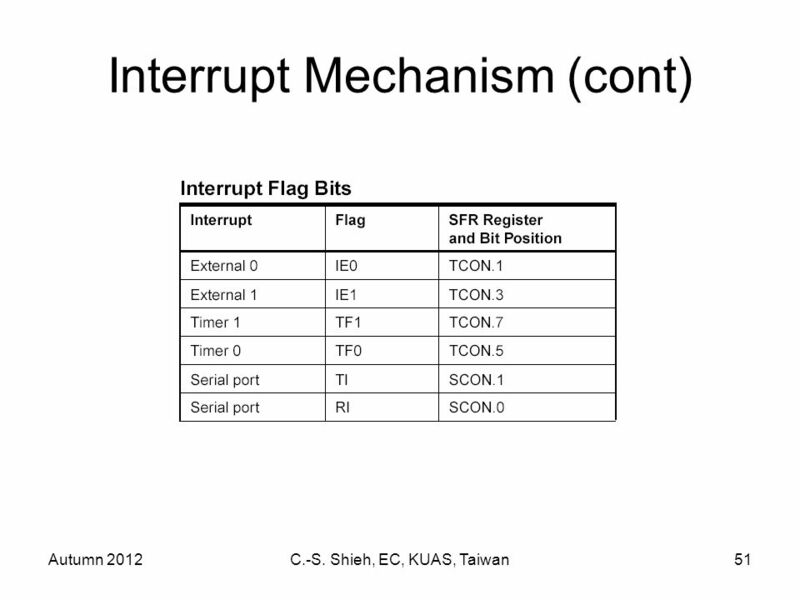 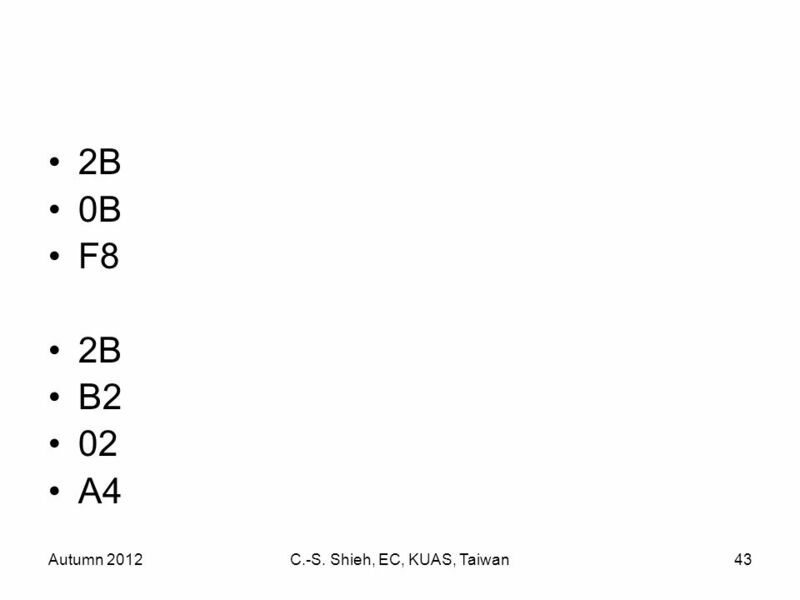 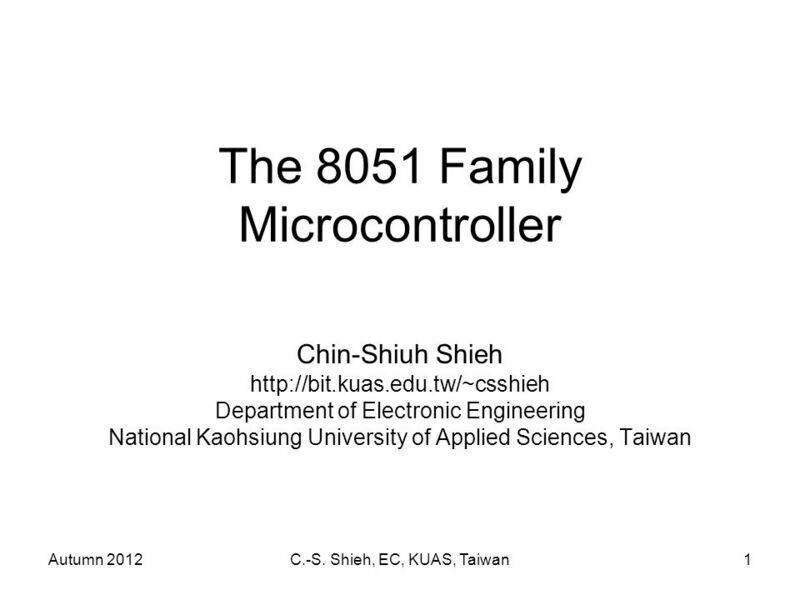 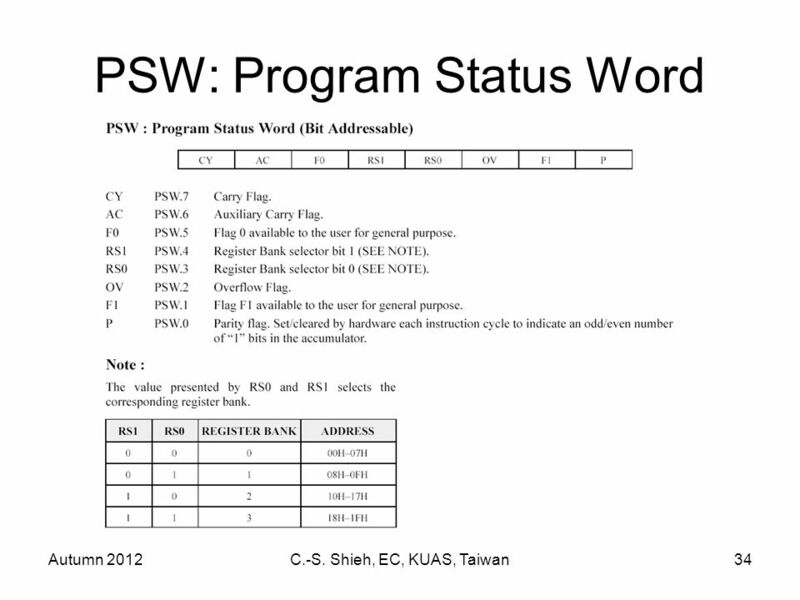 Download ppt "Autumn 2012C.-S. Shieh, EC, KUAS, Taiwan1 The 8051 Family Microcontroller Chin-Shiuh Shieh Department of Electronic Engineering." 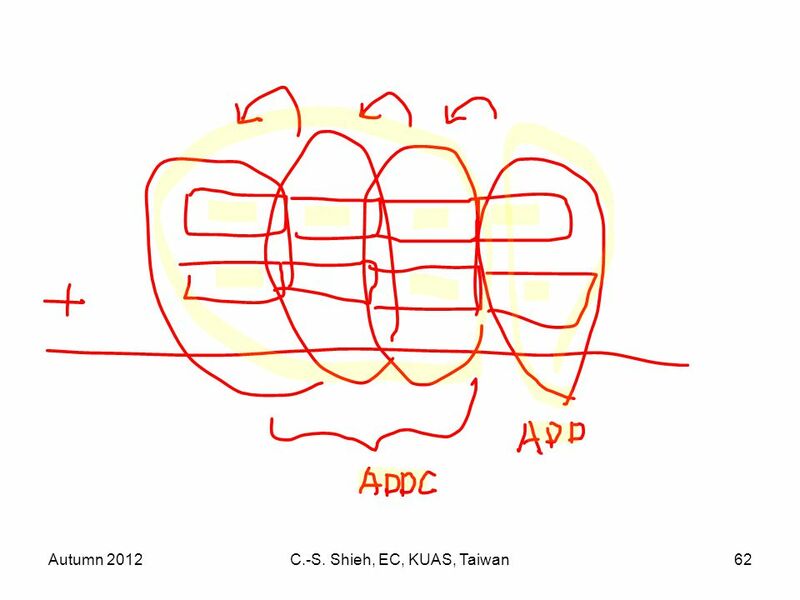 Autumn 2013C.-S. Shieh, EC, KUAS, Taiwan1 The 8051 Family Microcontroller Chin-Shiuh Shieh Department of Electronic Engineering. 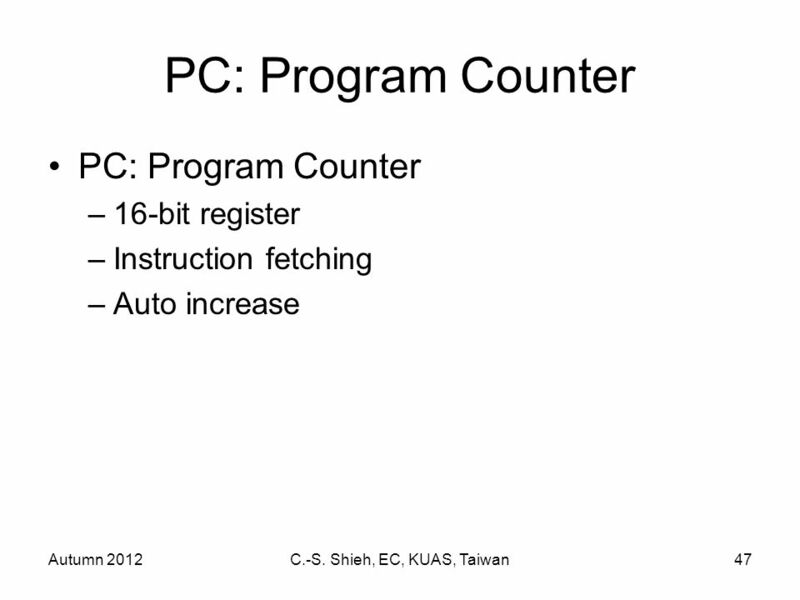 Suranaree University Of Technology มทส  2002 Anant Oonsivilai 2002/2/25 Microcomputers and Microprocessors 1 Chapter 4 I/O Port Programming. 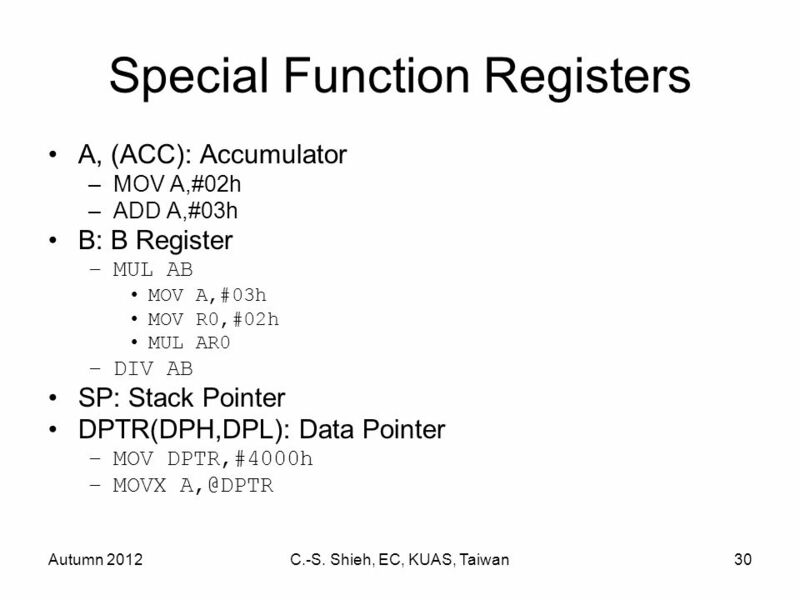 Chapter Microcontroller Objectives  Understand the 8051 Architecture  Use SFR in C  Use I/O ports in C.
kashanu.ac.ir Microprocessors 6-1 I/O Devices Switches, LED, LCD Lec note 6. 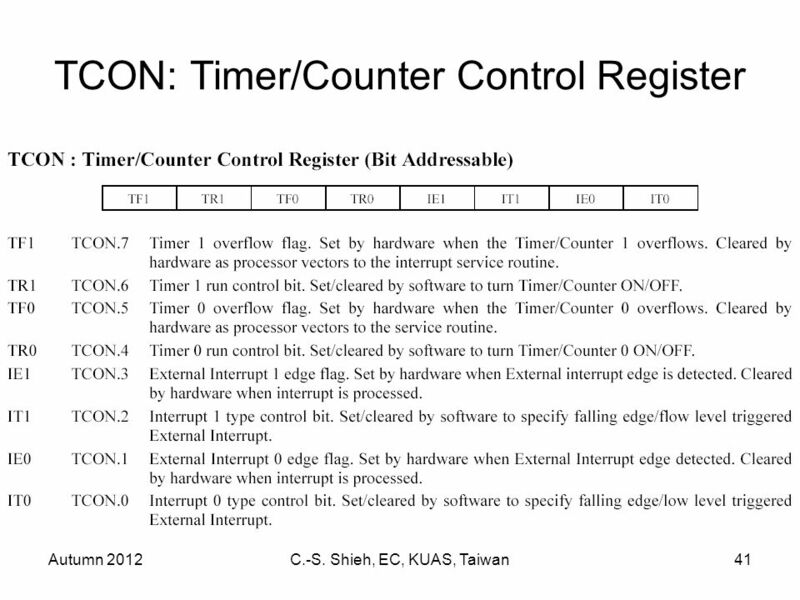 MICRO PROCESSER The micro processer is a multipurpose programmable, clock driven, register based, electronic integrated device that has computing and decision. 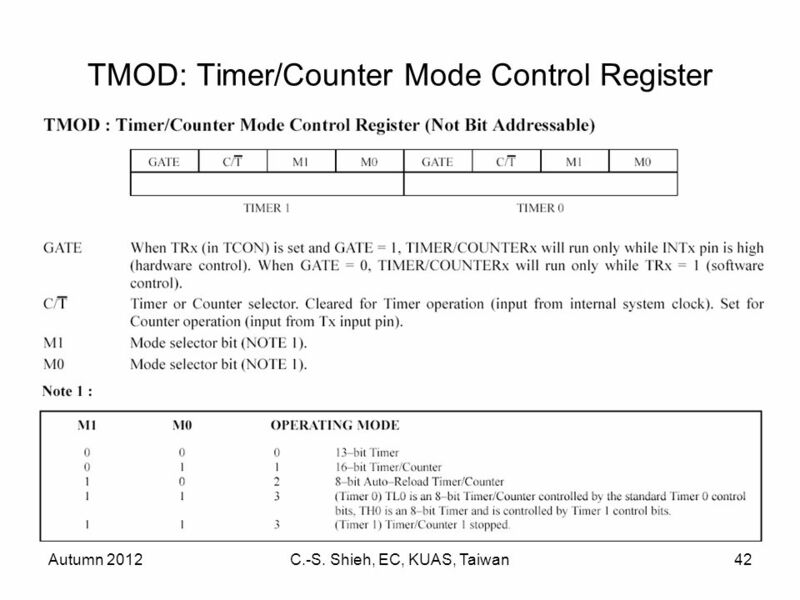 CSC Timers Since this is a microcontroller it mainly finds itself in embedded devices Quite often embedded devices need to synchronize events The. 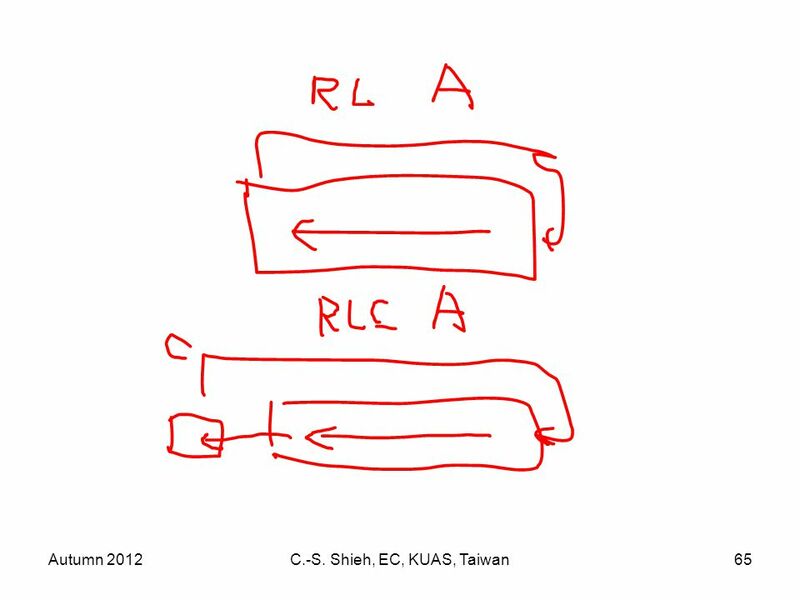 LS R First Design Key board. 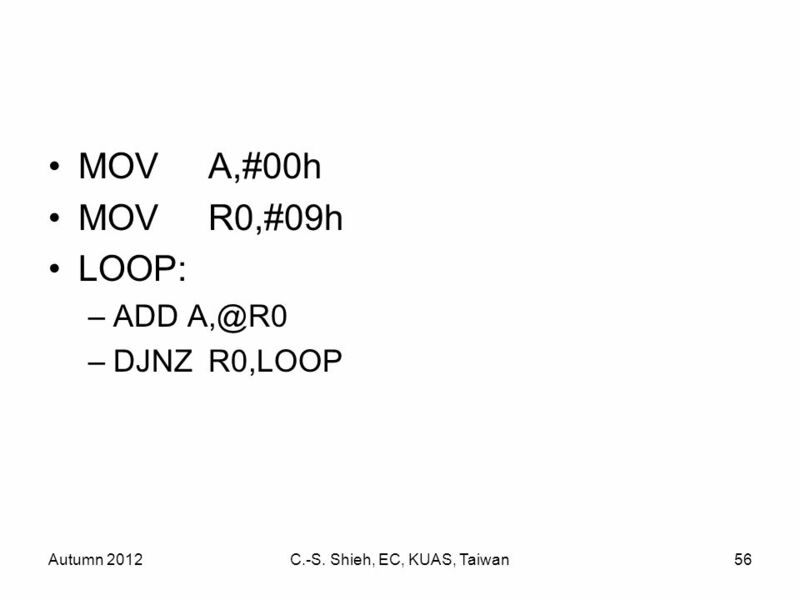 A B Second Design A B C D CD B Key board Third Design. 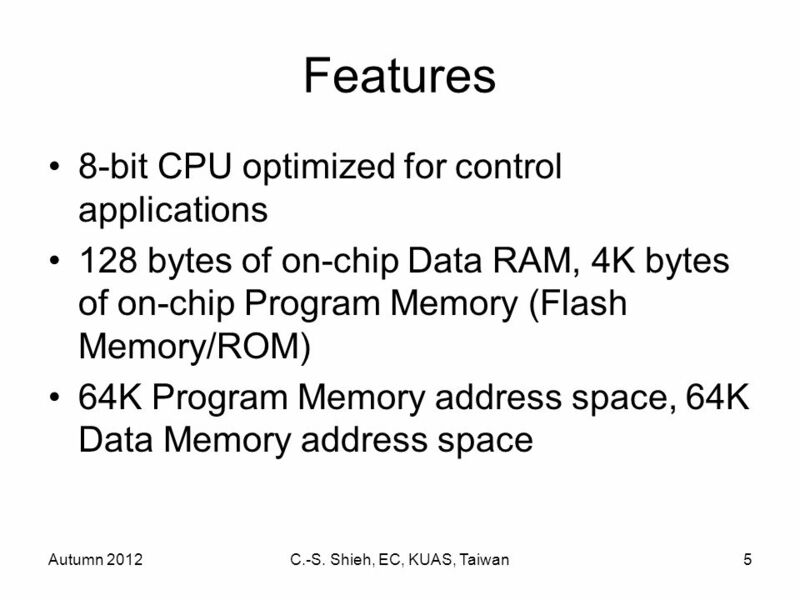 1 TK2633TK Microprocessor Architecture DR MASRI AYOB. 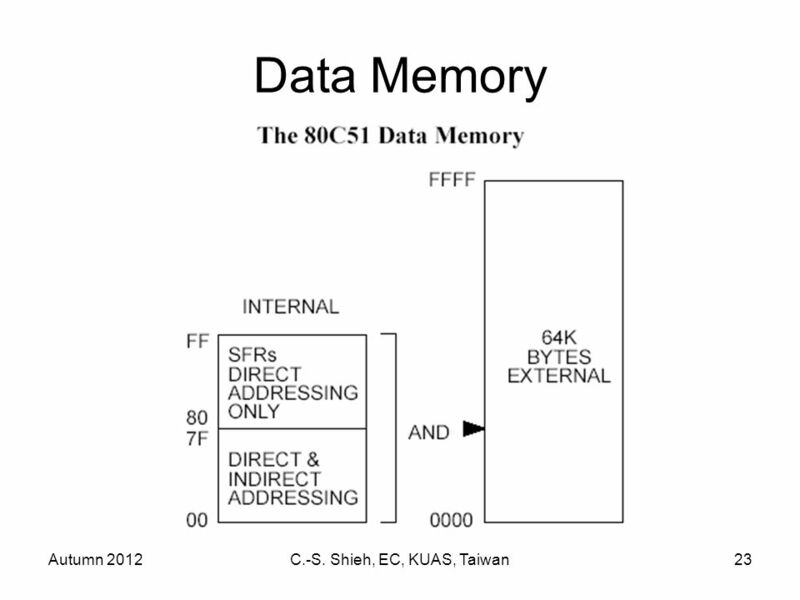 Architecture of the 8051 INTERNAL DATA BUS Oscillator & Timing Programmable I/O (32 Pins) 80C51 CPU 64K byte Expansion Control Serial I/O 4K Program Memory.